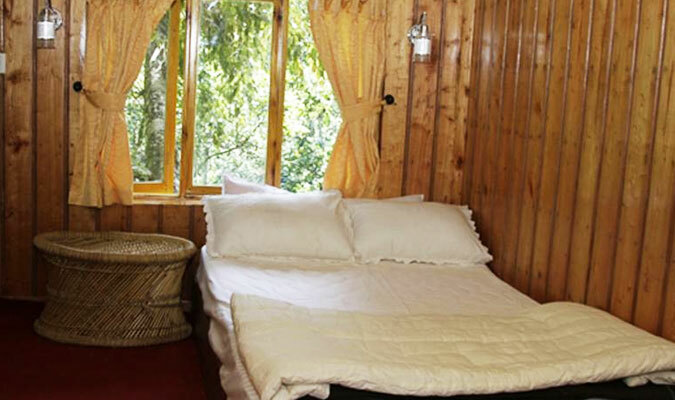 The Shola Periyar Tree house is set on a 1000 year old Banyan tree in Thekkady. It is set in the middle of rainforest surrounded by plantations of tea, coffee, cardamom and pepper. 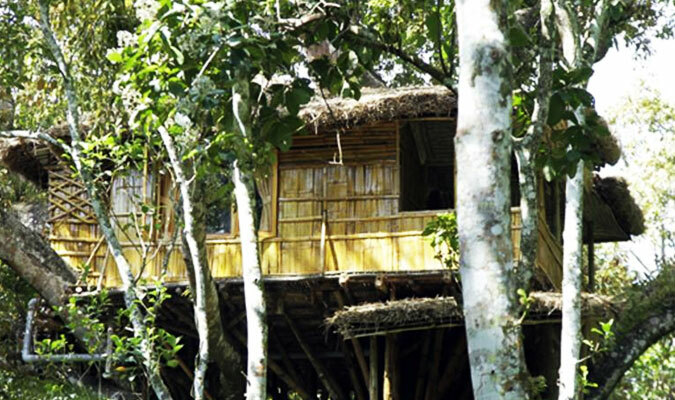 The tree house are built by the use of indigenous techniques, skills and expertise of local tribal craftsmen. The modern luxuries have been carefully fitted which creates a cherished stay. The Space - Set on a height of 80 feet, the Shola Periyar Tree House is equipped with modern features like beds, bathrooms with flush-able toilets, washbasins with running water, shower with access to fresh natural air and water. The eco-friendly tree house have used local raw materials such as coir mats, bamboo poles, hay straws, trees used as pillar etc. 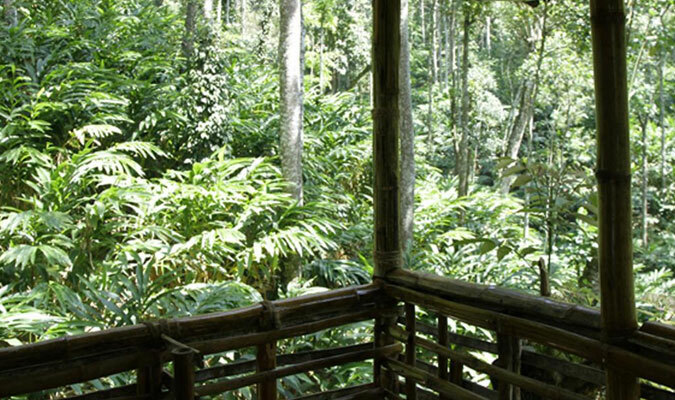 The balcony overlooks rainforests, plantations of tea, coffee, cardamom and pepper. Guest Access - Guest can access to tree house and to the plantation. Interaction with Guests - The resort staff are available all the time for guests. There are also specialists in the surroundings, the tribal techniques and rituals who can impart the knowledge to guests. 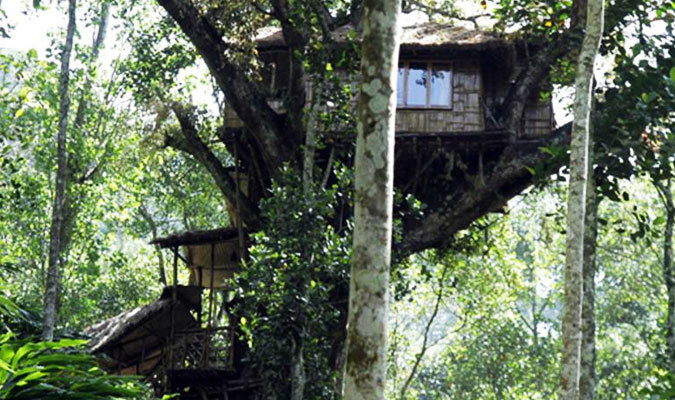 The Neighborhood - The Tree House is built in the neighborhood of Periyar Tiger Reserve, Thekkady. It is blessed with nature’s bounty, scenic charm, rich bio diversity owing to the river Periyar and Pamba. Sprawled over an area of 925 acre, Periyar is one of the 27 tiger reserves in India. It is a repository of rare, endemic and endangered flora and fauna. Getting Around - Cochin International Airport is 190 km away, Kottayam is 114 km. There are direct bus links to and from Thiruvananthapuram, Cochin, Kottayam, Munnar and Madurai. The lighting is provided by the hurricane lamps and kerosene oil.